I’m challenging myself in 2018 to tackle what I fear the most and for me it’s bags! Now there’s two types of individuals when taking on a new project. Those that will purchase books, view on line video’s and possibly take a class in order to maximize their experience on venturing into the unknown. 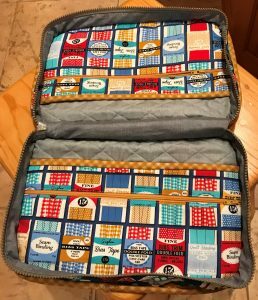 They sew through with grace and the seam ripper never seems to come out of their bag and they giggle with joy their completed project as it looks perfect. Then there’s those like myself, I see a picture and have the confidence of superwoman and just start grabbing fabric and start sewing! The seam rippers are everywhere (yes, this type of individual has many) and then I struggle. After many sewn and ripped seams, confidence starts to leave and I pull out the pattern and sit down to read. The project gets completed, but only after much drama. The fabric used in this bag was so dang cute I went to the manufacturer’s website (Robert Kaufman) to see if they had a pattern showing what they had done with it and sure enough they had a pattern designed by Heidi Kenney from www.mypapercrane.com. Loved it so I downloaded from Kaufman’s website and viewing the photo’s started sewing. Halfway through the project I had some time so I sat down and read the pattern (as she instructs you to do prior to starting). I then noticed the darkened highlighted text: Pattern Level: Advanced Expert. I froze. Gads, I’m not only doing a bag, but an advanced expert bag….but reading the instructions as Heidi suggests she guides you through an advanced expert pattern with ease. Somestimes the fear is worse than you envisioned. I did it! I challenged myself and it didn’t destroy me. 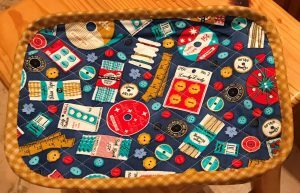 It actually is a really cute bag and if you “follow her instructions to read first” you will breeze through this project and be dancing around the house with your new sewing case! Did you know: There are youtube video’s on all Creative Grid templates. Go to creative grid rulers and type in the template you want and the video will pop up. They’re great. I’ve also found it’s so much more beneficial if I sew something using that template immediately after viewing video….sometimes referring to the video several times. If you still don’t understand, take your fabric and template to your favorite local quilt shop and ask for a demo (HELP!). They will love to help you. We’ve been waiting and it’s almost time….Farmhouse Threads and Friends have put together a new Mystery Quilt starting February 2nd. The theme this go around is “Garden”. I can’t wait. For those that don’t know about these mysteries, twelve designers get together and each week a different designer creates a block you may download. At the end they provide you with finishing instructions. The blocks are done in wool, but you may use whatever type of fabrics you enjoy. I’m and and can’t wait to get started. Remember February 2nd: www.farmhousethreads.com. Enjoy your week and challenge yourself. It will energize you.